The nose has toffee, apples, sawdust and a hint of copy paper. The mouthfeel is thin with no cling. The body has banana, apples, toffee and a little acetone. The finish has banana and copy paper. Water brings out banana and melted butter, and loses the copy paper. The body gains cooked apples, sandalwood, and a hint of cinnamon. The finish gains a little sandalwood. 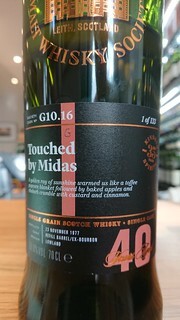 A wonderful aged grain, which is soft but not subtle - well integrated, to the point where flavours flow into each other. One for starting any evening off! Personal preference: I'd like more than one bottle.